Herder's Institute in Riga (Herder Institut in Riga) functioned between 1921 and 1939, its activities also included collection of folklore. The material was mostly collected by students of German nationality, the work was performed in Rīga, Liepāja, Cēsis as well as other places. In 1939, when the Herder's Institute in Riga was closed, this folklore collection was transferred to the Archives of Latvian Folklore by the German folklorist Lutz Mackensen, who had been an employee of the Institute for several years. 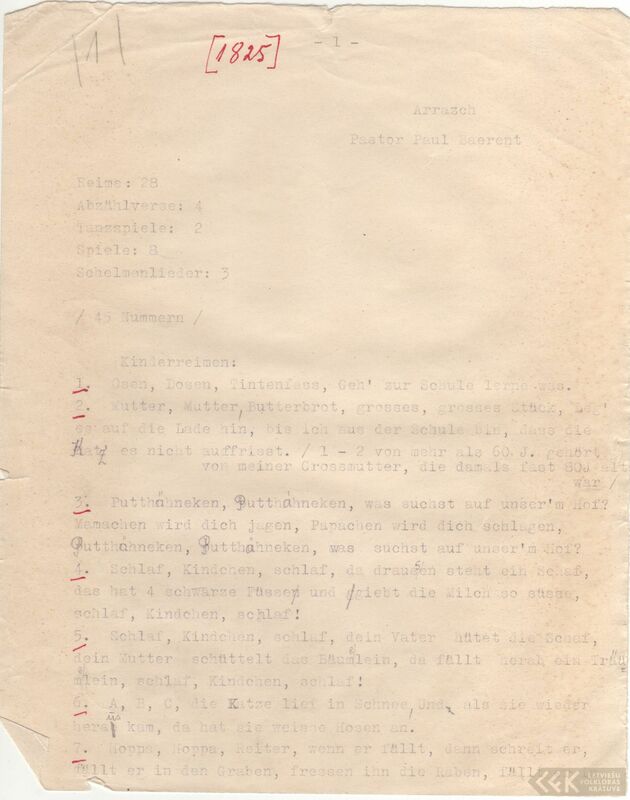 The materials submitted to the the Archives of Latvian Folklore was type-written. The fate of the manuscript originals is unknown; it is quite likely that these were taken to Germany. The size of the collection in numbers is as follows: there are 1,080 pages, containing 3,370 folklore items. The collection features many different folklore genres: there are children songs and rhymes, folk-tales, legends, songs of more recent origin, as well as melody notation, descriptions of games and dances, along with folk-belief, charms, proverbs, a few anecdotes, riddles, customs, etc. The prevailing language in the collection of the Herder's Institute is German, though there are also materials in Estonian, and a few in Latin, accompanied by a few phrases in Russian and Italian. There are also texts related to Livonian (Liiv) folklore. Showing 1-20 of 3,371 items. Showing 21-40 of 1,075 items.